Terrorists kidnap a nuclear scientist. Later a strange passenger and strange cargo are loaded aboard a tramp steamer which will pass within a few miles of a ship loaded with gold bullion. Coincidence? 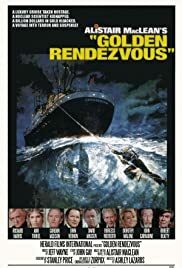 THE GOLDEN RENDEZVOUS is one of those films which evokes "what ifs..." What if the producers had attached the prelude filmed when the show was broadcast on network TV? What if they had hired someone other than the thoroughly soused Richard Harris? What if Ann Turkel had been costumed in sexier outfits? And what if the producers hadn't hired a very overweight (and, at that time, very well known) Dorothy Malone for a throwaway role? The prelude, added for TV does wonders for the films exposition. The film sans the prelude is much truer to the Alistair MacLean novel, but what is clever in novels is sometimes simply baffling on the screen. The ending is actually better than the novel; and, it would have been great if Harris hadn't resorted to some silly derring-do with dual submachine guns; and even better if he hadn't forgotten his lines in the denouement? The best thing about this movie is the terrific (and I mean TERRIFIC) score by Jeff Wayne. The music adds a sense of urgency one never feels from what is up on the screen.